Located north of downtown Fernie, BC, at the head of Fairy Creek. 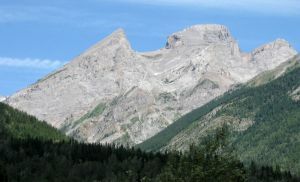 This rugged, multi-summited, mountain is highly visible from downtown Fernie and a popular objective for the local population. Access is via logging roads that run along Hartley and West Sulphur creeks to a trailhead. The trail climbs steeply through forest at first, then turns south and becomes more level before reaching the pass, and then climbs up the west ridge to a microwave tower on the summit. Name Notes: Was called Gamble for a short while.